Many IVF clinics in India continue to routinely transfer four or five embryos during the IVF treatment, even for young patients who are doing their first IVF cycle . This is worrisome , because the risk of these patients having a multiple pregnancy after the transfer of so many embryos is extremely high . Many will end up having triplets , when they run the risk of having babies with lifelong disabilities because of their preterm birth. Others will end up miscarrying after a selective fetal reduction. The IVF doctor , on the other hand, will proudly count the pregnancy as being a success, when in real life, it’s actually been a disaster for the patient. This is because the doctor does not have to provide the pregnancy care or look after the preterm babies, which means he is often blissfully unaware of the adverse consequences of his actions. clinic ! This is because they don’t have enough confidence in their lab, and are forced to resort to transferring so many embryos , in order to artificially inflate their success rates. A good clinic is able to create good quality embryos which have a high implantation rate. Patients contribute to the problem by pressuring doctors to transfer more embryos, because they feel this will improve their chances of having a baby. Most are so fed up of not ever getting pregnant, that they are willing to risk the possibility of a multiple pregnancy, and feel that anything is better than not getting pregnant. Little do they realize that by doing so they have pushed themselves from the frying pan into the fire. Please remember that transferring more embryos does not increase success rates – all it does is increase the risk of a multiple pregnancy . More is not always better ! 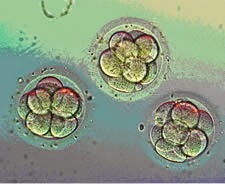 A good clinic will usually transfer just one embryo ( if it's a top-quality blastocyst ) . For selected patients ( for example, those who are older , or those who have failed many IVF cycles, they may be justified in transferring more embryos). In a good clinic, 50% of top quality blastocysts will implant successfully. This means their implantation rate is 50%. The reason the other blastocysts do not implant is because they have a lethal genetic problem ( which we cannot identify) causes them to stop growing and prevents them from implanting. A good clinic which has a high pregnancy rates because it creates top quality embryos with a high implantation rate will discourage patients from transferring too many embryos , because they are confident they will have a high pregnancy rate even after transferring just one or two embryos. Even better, the spare embryos are not wasted. The supernumerary embryos can be cryopreserved safely, and used later on to complete your family ! Worried that your IVF doctor wants to transfer too many embryos and that he is takig the risk of a multiple pregnancy too lightly ? Please send me your medical details by filling in the form at http://www.drmalpani.com/free-second-opinion so I can guide you sensibly ?